About bullying: "I say simply stop and think. What is that person were to finish their life because of you. How would that feel? Also, bullies often have issues of their own – why else would they do it. Maybe they need to face their issues...Not in the true sense of the word but I have been the victim of the media at times – goes with the territory, but it is still not nice. You have to say to yourself "Don’t take it personally" but thats not easy –especially when the claims made about you are unjust. It’s frustrating" (Towleroad Interview: Ben Cohen). On Top Mag: “For some years now we have been receiving messages and emails from people all over the world with some heart wrenching stories. I really felt that I wanted to do something about it and I felt that I could, the [anti-gay bullying] video I made sparked off all sorts of things really, as well as emotions in me as a sports figure and as a dad, so we started thinking about what we could do. Then we received an invitation to go to a sports bar in New York. And then a proposal from a gay/gay-friendly rugby club in Atlanta at the same time” (Ben Cohen: Heart Wrenching Stories Prompted Me To Stand Up Against Homophobia). 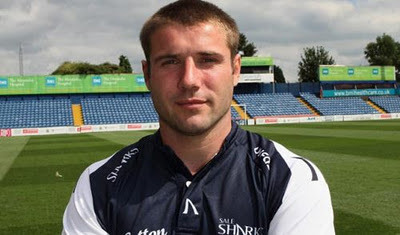 Ben Cohen MBE (born 14 September 1978 in Northampton), is a former England rugby union international. He began his professional career with Northampton Saints in 1996; in 2007 he moved to France to represent Brive before returning to England two years later to join Sale Sharks (Wikipedia).